We've had a surprisingly warm weekend and just like that all of our snow has disappeared. So let's show some ankle! I pulled out my favorite plaid pants from Old Navy and these fab cut out booties from thredUP. It's still cool enough for a sweater on top though. The colors in these pants make them so easy to find matching colors or complimentary neutrals to pair with them. Grey tones downs the boldness of the plaid, but I think a red would be a fun color to pair with them in the future, too. See how I've worn these pants with a white sweater and navy sweater. See how I've worn this top with a vest and in all grey. I love plaid so these pants are so fun. Saturday was glorious outside, wasn't it? This is such a fun look! I love your plaid pants and hat! yay for warmer weather and for cute pants!! adorable outfit! Love this! Such a great look! your shoes are gorgeous too! Those pants are adorable and I LOVE the shoes! You styled these plaid pants so well! I always struggle with patterned pants, so much that I avoid buying them. You did awesome! I love your shoes, I've gotten so many great pair from Thredup! Love the plaid pants with your great grey sweater! It seems like everyone got slightly warmer temps and is so happy about it! I know I am. This is SUCH A cute look. I love those plaid pants, and the pockets on the sweater are super handy! Very comfy look! love the pink hat! Looking so fab! Love the plaid pants! This is such a fun look! 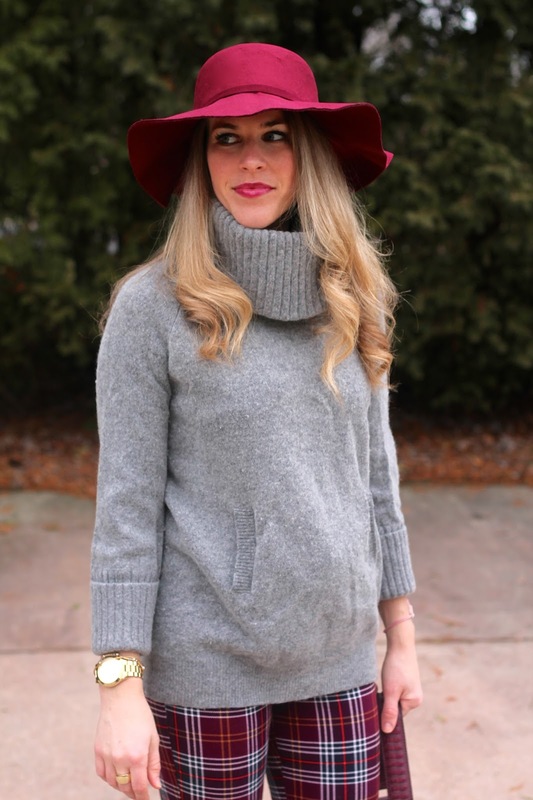 I love the mix of classic and funky elements, like the cozy sweater and floppy hat. It all works so well together! Love these pants! They look amazing with the grey sweater! I love your look and how well it suits you! Grey and dark reds is such a great combo! Such a great look - colors and pieces are perfect! Love this look from head to toe!! I want those pants!! Beautiful! Have a great week!! You always look adorable in floppy hats. I must say these plaid pants with the rest of the pieces in this outfit match perfectly. Great bag!